The Palace on Wheels is not just the first luxury train of India, but also is the first attempt in bringing the best of royalty in every way. Certainly the oldest and most popular of India luxury train, the Palace on Wheels train is rated one of the ten best luxurious train journeys in the world. Authentic in every way and form, this train promises to transport the travellers back to the royal times when the luxury was a way of norm of life in its course of seven days. The carriages of the train have the history of their own. Designed on the royal themes of the personal coaches used by princely rulers of Rajasthan, these carriages assure the travellers of a worthy royal experience. Decorated in rich traditional style, including draped curtains, hand crafted lights, and Rajasthani art, these coaches recreate the perfect ambiance suiting the guests’ royal likings. Even the names of the carriages are named after a city in Rajasthan. 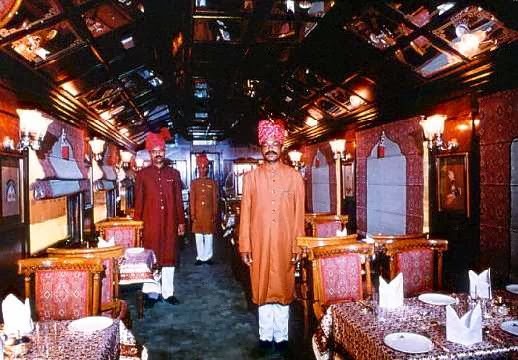 The course of action of the Palace on Wheels continues in night time when the guests are transported from one city to another in the assured comfort and opulence. And every day begins in a new destination, offering them new travel excursions and sightseeing options in regal fervour. There, the guests get to know the meaning and essence of royalty in the form of visiting forts and palaces in Jaipur, Jaisalmer, Jodhpur, Chittorgarh and Udaipur. In addition to this, the guests also get to relive the royal lifestyle with the indulgent game drives to Ranthambore National Park. Besides the plush accommodation at night, the luxury train also offers other inclusions based on royal inclinations. There are two restaurants on board, namely the Maharaja and the Maharani serving the guests with an indulgent palate suiting their tastes and fantasies. Similarly, the guests can also indulge in the royal spirits, thanks to the inclusions of bar lounge area. The Royal Spa aboard is also well equipped in relieving guests’ travel jetlag through various massages, therapies and revitalising solutions amidst royal ambience. All this and much more illustrate the bejewelled legacy of the oldest luxury train in India. Surely, the Palace on Wheels Train tour is one of the best luxury train experiences in the country.